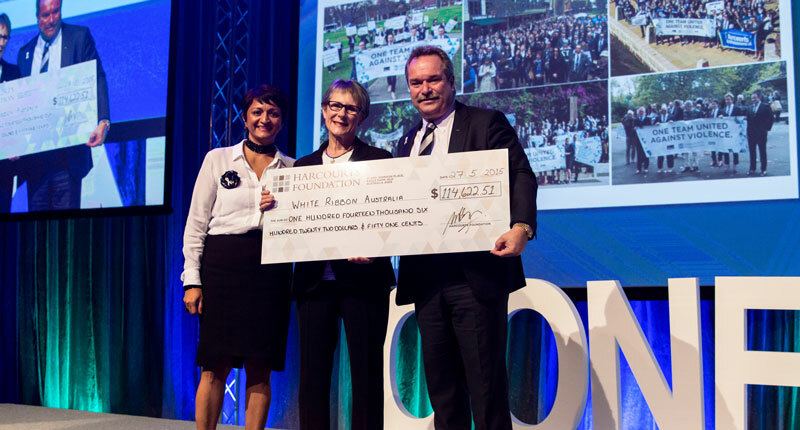 Ever since the Harcourts Foundation was launched in August 2008, Team Harcourts throughout Australia have been raising money to provide support that helps, grows and enriches their communities. Whether an office, business owner, sales consultant or personal assistant, members of Harcourts all over Australia are donating to the Harcourts Foundation. The majority of the contributions are from our Harcourts branches, whose business owners and sales consultants contribute a set donation with every single property they sell. In addition, through salary sacrifice, specially organised fundraisers, and regular prize auctions at corporate events of all levels, all Harcourts members are committed to making a difference. Since inception in 2008, we have nearly reached the significant milestone of raising $5,000,000 globally for our local communities. This huge achievement is one of many milestones that the Harcourts Foundation is sure to reach in the years ahead. Thank you all for your incredible support! In her role as the Coordinator for the Harcourts Foundation across Australia, Julia drives awareness and support within Harcourts, helping to build the culture of philanthropy from corporate through to office level Harcourts-wide, while providing opportunities to increase the amount and ways both groups and individuals can contribute. Julia works closely with the state Ambassadors, Accountant, Internal and External Communications and Executive Committee to achieve the Foundation’s goals. Julia can be reached at australia@harcourtsfoundation.org or on (07) 3839 3100. As the accountant for the Foundation in Australia, Toni plays an integral part in the overall process by overseeing the finance administration and treasury. Toni captures and maintains up-to-date records of all donations made into the Foundation, as well as all Grants made out to the communities from the Foundation, and ensures all obligations to tax authorities and charity regulatory bodies are met. Toni also supports the Australian Coordinator and Ambassadors to help coordinate state, national and international fundraising initiatives. Toni can answer your Foundation accounting queries on accounts@harcourtsfoundation.org or on (07) 3839 3100. Anna’s aspiration as our Foundation Ambassador in Tasmania is to contribute towards changing people’s lives for the better and making dreams come true. Since the launch in 2008, each and every one of Harcourts Tasmania’s offices state-wide have come together and make a set donation to the Harcourts Foundation with every property sold. Anna is your key contact with all Harcourts Foundations enquiries, applications and support in Tasmania and she encourages you to contact her at anna.gooch@harcourts.com.au or on (03) 6331 5111 if you would like to know more information on the Harcourts Foundation in Tasmania. Adrienne has been the WA Ambassador for Western Australia since the Foundation’s launch in 2008 and is responsible for all grant applications received. The main source of our WA funding is through the auction of donated prizes and the generous support of our Business Owners & offices who bid for these prizes. Since the Foundation formation, substantial funds have been channeled back into the WA community with the primary aim to assist those who need it most. Preference is given to local entities where the benefit to the local community is maximised, with all funds raised in WA staying in WA. For Western Australian information on the Harcourts Foundation please contact Adrienne direct – adrienne.musca@harcourts.net or on (08) 9388 7700. Sharon is the Harcourts Foundation Victorian Ambassador, and processes all grant applications received from Victorian charities, as well as managing all communication between the Harcourts Foundation and the applicants. Driving awareness and support within Harcourts and in the public arena, Sharon keeps everyone in Victoria up to date with the latest news from the Harcourts Foundation. If you would like more information on the Harcourts Foundation in Victoria, please email Sharon on sharon.kupsch@harcourts.net or on 1 300 856 773. Encouraging the adoption of the Harcourts Foundation throughout Queensland, Jo, in her role as Ambassador, promotes the Foundation to the Harcourts Queensland network and fosters positive relationships with charitable organisations throughout the state. As well as speaking about the Foundation to new business owners and staff, Jo also represents our Foundation at events across Queensland and is involved in recommending the disbursement of funds to various charities. Jo can assist with any Queensland-related queries by contacting her at jo.menken@harcourts.net or on (07) 3839 3100. The Harcourts Foundation represents the heart of our core values as a group. Madeleine is one of our newest representative Ambassadors and provides information and assistance for the people in NSW. She plays an important part in assisting with this great legacy by bringing awareness within both the Harcourts NSW group and the community, with an ongoing commitment to change the lives of those in need. For New South Wales support and assistance, please contact Madeleine at nsw@harcourts.net or on (02) 9380 8665. All of our team members have a firm belief in providing support that helps, grows and enriches our communities.